2. Close all running instances of Tally.ERP 9. Note: Tally.ERP 9 Release 5.4 is compatible with Tally.Server 9 Release 5.2 only. If you are migrating to Tally.ERP 9 Release 5.4, you need to download and install Tally.Server 9 Release 5.2. 1. Go to Gateway of Tally > click F1: Select Cmp. 2. Enter the location to which you want to migrate the company data, in the field Path of the Select Company screen. 3. Select the company from the List of Companies, and press Enter. 4. Click Yes in the prompt Migrate. 5. Click Yes in the prompt Backup before migrating? if required. 6. Select the required module and press Enter to open the respective report. ● User A closes company in previous version of Tally.ERP 9 and then migrates the data to Tally.ERP 9 Release 5.4. Both users A and B can access the company in Tally.ERP 9 Release 5.4. Both users cannot open the company in the previous version of Tally.ERP 9. ● User B closes company in previous version of Tally.ERP 9, and then opens the company in Tally.ERP 9 Release 5.4. ● User A closes company in previous version of Tally.ERP 9, and then migrates the data to Tally.ERP 9 Release 5.4. User A can access company in Tally.ERP 9 Release 5.4, and cannot reopen it in the previous release. ● User B has company currently opened in previous version during migration. User B can continue working on data in the previous version until the running instance of Tally.ERP 9 is closed. Changes made to the data in the previous version will not be migrated automatically. The user has to migrate this data manually. ● The company is closed in the previous version. ● Any report which has been modified in the migrated data, is opened. 1. Open the company in Tally.ERP 9 Release 5.4. 2. Press Ctrl + Alt + M.
3. Select the modules you want to migrate from the List of Modules. 5. Enable Backup before migrating? to create a backup, if required. 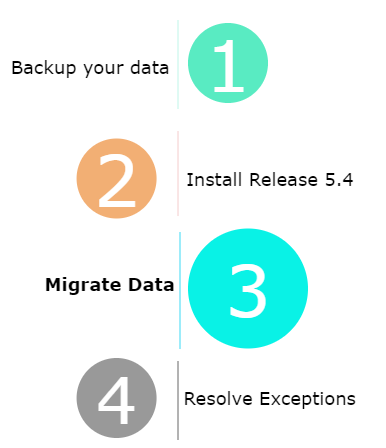 If this option is enabled, the data is migrated after a backup is created. Note: When you migrate data from Tally.ERP 9 Release 4.9x to Release 5.4, first import the payroll statutory masters by pressing Ctrl + Alt + I on Gateway of Tally. This will import the latest income tax statutory masters to your company. After moving to Release 5.4, any changes made to company data will be lost if you are moving the data back to Release 4.9x. You cannot rollback the payroll statutory masters after migration. o Sales, purchase, and party (state, type of dealer, and tax registration number). o The rate for each duty ledger, if there is more than one duty ledger. o VAT adjustment flags for journal vouchers. o The nature of transaction for sales and purchase transactions. After your data is migrated, the Nature of Payment for ledger masters specified as Any is changed to Undefined. You need to change this to Any again. 1. Create the nature of payment, Any. 2. Open the required expense ledgers. 3. Select Nature of Payment as Any. After your data is migrated, the Nature of Goods for ledger masters is changed to Undefined. You need to change the Nature of Goods, as required. 1. Go to Gateway of Tally > Accounts Info. > Statutory Info. > TDS Nature of Pymts > Alter. 2. Open the required sales or duty ledgers, or items. 3. Select the required Nature of Goods. Post migration, you need to reconfigure the excise duty head classification and duty ledger master. 1. Go to Gateway of Tally > Accounts Info. > Excise Duty Classification > Alter. 2. Select the required Duty Head and Calculation Method. 1. Go to Gateway of Tally > Accounts Info. > Ledger > Alter. 2. Select CENVAT in Type of duty/tax. 3. Select Duty Head as Applicable. 2. Press F12:Configure and enable Allow creation of tax ledgers under other groups? 3. Set the option Behave as Duties & Taxes to Yes. 4. Select CENVAT in Type of Duty/Tax. 2. Set the option Allow method of appropriation (used in purchase invoice)? to Yes. 1. Go to Gateway of Tally > Inventory Info. > Stock Items > Alter. 2. Enable Set/alter MRP details? in Stock Item Alteration screen. o Enter the MRP Rate. No changes are required for service tax. After successful migration, splitting company data with data from multiple financial years may be required and there may be some exceptions to resolve. 1. Go to Gateway of Tally > Press Alt+F3 > Verify Company Data. 2. Correct any errors related to ledgers, banking transactions, duty amount, and so on. Earlier the excise reports Credit Summary, Credit Availed, Abstract and the PLA Summary were available in Release 4.9x as a separate menu. In Release 5.4, they are provided as part of RG 23A Part 2, Form ER1 and PLA Registers. ● Go to Gateway of Tally > Display > Statutory Reports > Excise Reports > Manufacturer > CENVAT Registers > RG Part 23 II. ● Go to Gateway of Tally > Display > Statutory Reports > Excise Reports > Manufacturer > Excise Forms > Form ER 1. ● Select CENVAT Credit Availed, and press Enter to view the details of the CENVAT credit availed. ● Select Less: Cenvat Credit Utilised, and press Enter to view the details of the CENVAT credit utilized. ● Go to Gateway of Tally > Display > Statutory Reports > Excise Reports > Manufacturer > Excise Registers > PLA Register.